The delayed delivery of Windows 10 October 2018 Update could put the pinch on companies looking to upgrade from Windows 7 before support for the aging OS ends next January. Microsoft's months-long delay in getting the latest Windows 10 feature upgrade to customers could not have come at a worse time. The slow delivery of Windows 10 October 2018 Update, also known as 1809 in Microsoft's nicknaming yymm nomenclature, may pinch enterprises' migration from Windows 7, impact the expected shift to longer-supported versions of Windows 10 and temporarily stymie businesses from skipping multiple upgrades. Windows 10 1809 only began a phased roll-out to customers - almost entirely consumers at the start - a week ago, even though the upgrade was initially released Oct. 2, 2018. The roll-out should have started to show up on eligible PCs no later than the middle of October. But a bug that deleted users' files - a flaw reported prior to release by some participants of the Windows Insider beta program - forced Microsoft to withdraw the upgrade from all release channels, apply a fix to the flaw and then return 1809 to Insider for additional testing. Because of the three-month delay, customers running unmanaged PCs - all those powered by Windows 10 Home and many of the Windows 10 Pro devices - will probably run 1809 for just half as long as normal, three months rather than six, before they're required to upgrade to this year's 1903. The most important of those deadlines is Jan. 14, 2020, when Microsoft ends free security support for Windows 7, making the OS a risk to run after that date. Businesses with Windows 7-powered systems, then, have until Jan. 14 - 356 days from today - to upgrade those PCs to Windows 10. Windows 10 Enterprise 1703's support will dry up in October, three months before Windows 7's retirement. Windows 10 Enterprise 1709 and Windows 10 Enterprise 1803 drop out of support April 14, 2020, and Nov. 10, 2020, respectively, or three and 10 months after Windows 7 support goes dark. Windows 10 1709 is little better; its support runs out in 15 months, giving the company only seven months on this version after the upgrade. The two upgrades - from Windows 7 to Windows 10 1709, then from 1709 to a successor - would have to overlap to some degree. But as Figure 1 shows, as soon as the organization finished installing 1709 it would have to begin installing a follow-up, such as 1803 or as shown, 1809. Even then, 1709 would make it onto the business's machines just four months before Windows 7 hit its sold-by date (Windows 7's retirement is marked by the blue vertical bar). Windows 10 1803 is immediately available and tested, but its end-of-support date presents a problem. That date - Nov. 10, 2020 - is far enough in the future and the migration could be wrapped up before Windows 7's support lapses. 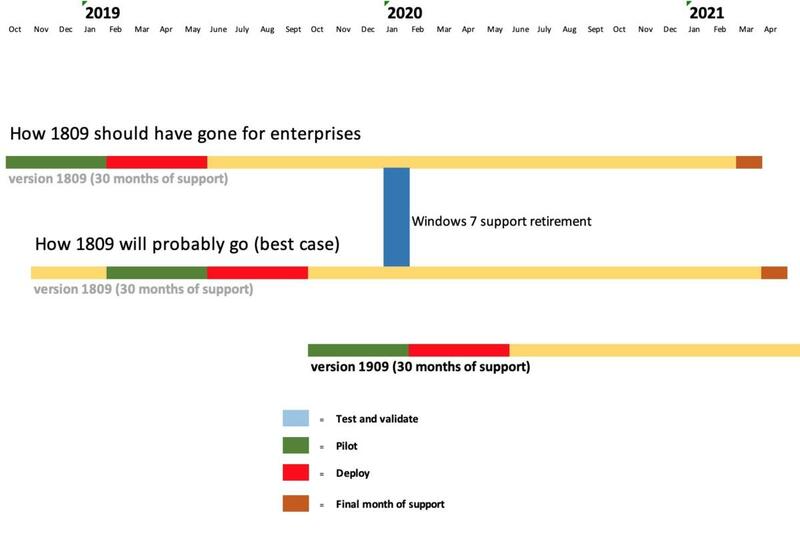 But as Figure 2 illustrates, the natural successor, this year's 1903, would be a mistake because even for Windows 10 Enterprise customers, it will get only 18 months of support. That means holding out for 1909, which will receive 30 months of support. Trouble is, the company won't have much of an upgrade cushion from 1803 to 1909; the upgrade will have to begin as soon as the latter is declared enterprise-ready and even then, the cushion will be a short four months. Windows 10 1809 should have been the perfect upgrade from Windows 7. 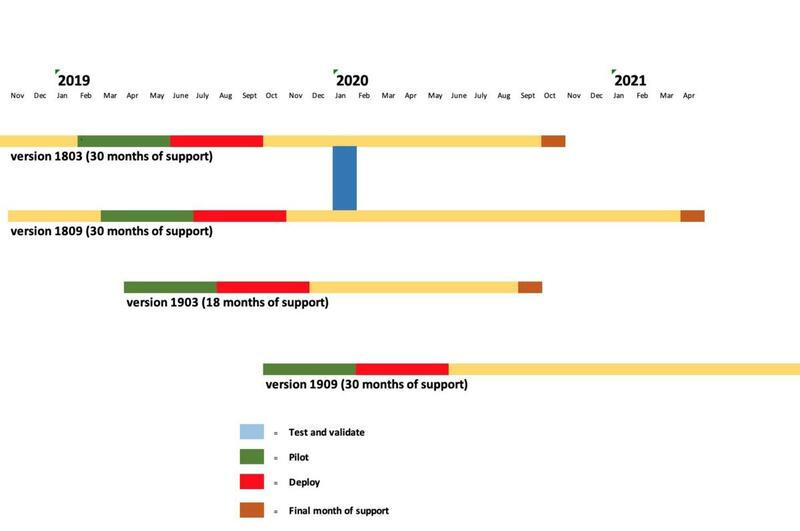 It's almost certain that Microsoft intended it to be, what with some of the steps it took before it was to launch (prime example: the 30-month extension of support for the feature upgrades designated xx09. But it didn't work out, as Figure 3 shows. 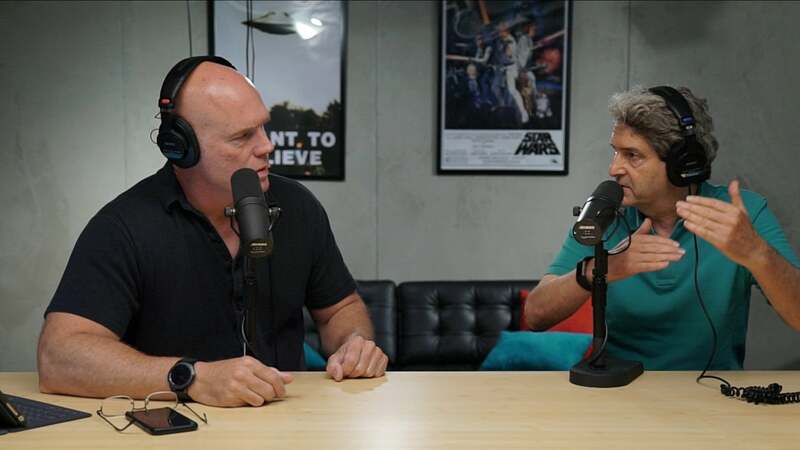 If Microsoft had not had to yank 1809 and push back its roll-out by three months, enterprises would have spent October through January piloting and testing the build. Then, when Microsoft certified 1809 as corporate-ready - by the end of January at the latest (more likely in the first half of December) - enterprises could start deploying Windows 10 as Windows 7's replacement. Deployment would presumably finish in May, giving organizations a seven-month-and-more cushion before Windows 7 slid out of support. Instead, the file deletion bug pushed the schedule back by four months. Microsoft will probably use extreme caution and not certify 1809 as enterprise-ready until May. Deployment, then, would occupy the company's IT through October; assuming the migration encounters no showstoppers, it should be completed with three months to spare. That's cutting it close.